A lot of musicians see music licensing as this big, super-intimidating goal. Maybe you feel like you need to have a publisher before you can start. Or perhaps it seems like you need to have a catalog of at least 50 songs before you can even think about submitting anything to licensing opportunities. Or you may even think that you need to hit a certain level of popularity before your music will be “in demand” enough to get licensed. Let me tell you right off the bat that those are all just excuses that hold you back. That’s it! 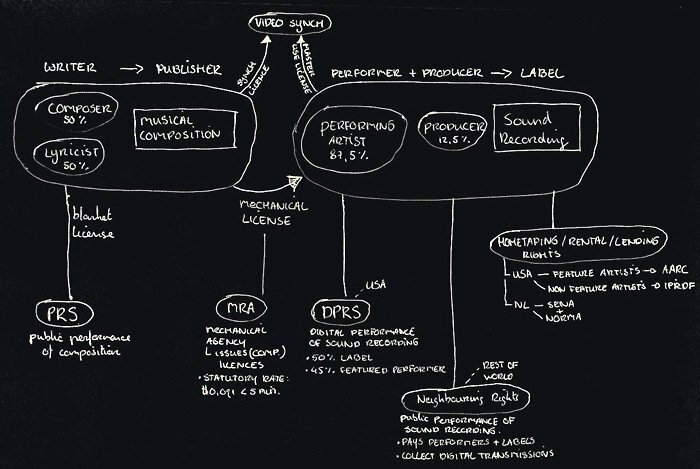 In the music licensing industry, you’re going to get a whole lot further if you START. So start prepping the tracks you already have, start researching music libraries and other placement opportunities, and start actually submitting. To help you get that initial momentum going, we’re going to go through each of those three things one by one. Use this as a checklist for yourself to start moving towards your licensing goals. When it comes to your musical approach to licensing, you have two options (note that these are not mutually exclusive). The more music you have to sell, the more earning potential you have. Seems pretty obvious, right? The big question is: how do you become a prolific composer? My tip is simple: embrace imperfection and work under the assumption that quality will come through quantity. I mean that if you challenge yourself to write songs faster than ever before, you’ll come up with some crappy tunes and some great tunes. One exercse that has worked wonders for me is working with an artificial deadline. Here’s how it works. Set a 30 minute timer for yourself and write a new song with a beginning, a middle, and an end. It doesn’t have to be a long song or even a very good song. The only rule is that when the timer goes off, you stop what you’re doing and bounce the MP3. The goal is not to finish the track in 30 minutes. The goal is to create SOMETHING, whatever that is, in 30 minutes. This exercise ensures that you always have a lot of raw material to work with. By forcing yourself to just write you’ll stumble upon a lot more ideas. Some may not be that great, but some will be gems that you can come back to and refine. THIS is how I manage to write dozens of songs in a year. Another approach to building out a licensing catalog is to write in a particular niche. Now of course, the less crowded the niche is, the more this applies. The thinking is that if you just jump on the latest trend, you’ll be part of the cattle herd. It will be your song in a sea of thousands. But if you focus in on a particular (less crowded) genre or sub-genre, you’ll be able to shine. Let’s say you love reggae and it’s something you’re really good at writing. In the grand scheme of things, there really aren’t that many people specialized in reggae. And that means the music production libraries are not flooded with reggae music. If someone types in “reggae” in a music library, you’ll be towards the top! If someone asks a small boutique library for reggae available exclusive, the staff will get in touch with you and ask if you can write something for them. Of course, there are less licensing opportunities for reggae tracks than there are for EDM or happy quirky corporate tunes, BUT (and this is important) you’ll get a look-in almost every single time there IS a reggae opportunity. Now that you have the music and know you can write quality new tunes whenever you want, it’s time to put together a strategy. But here’s the simple truth: music is your career, your job, and your business. 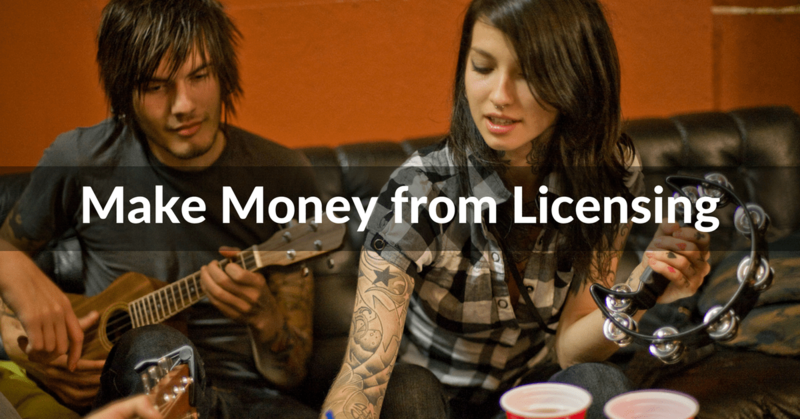 If you don’t want to make money with your music, stop reading this and go get a job. If you DO want to make money from music, you need to realize that you’re not the only one. Especially with music licensing, it’s bit of a competition. Now I don’t want you to freak out. It’s a competition with the potential for a LOT of winners. The demand for great music is SO high today that there’s room for lots of musicians to be very successful. If you strategize and focus on the activities that will yield the highest results (whether that’s exposure or financial gain), you’ll have more energy to stay persistent longer. This will take some time to figure out, but over time you’ll start to realize what your big winners are. Focus on what works and cut everything else out. In order to strategize, you need to know yourself and your music. Let’s start with a SWOT analysis! The acronym stands for Strengths, Weaknesses, Opportunities, and Threats. Identify your strengths and weaknesses as a music composer and business person (because your music is your business). Identify opportunities for your music and what threatens to derail your progress in the licensing industry. What’s my production profile? Can I record a lot of music at little cost or am I limited in the number of tracks I can put out every year? Is my music catalogue very specific and niche or could I benefit from focusing on a sub-genre for a little while? Am I good under pressure? Do I like working with really tight deadlines? Will the last minute cancelation of a project frustrate me? Am I more productive working alone or with a team? Who in my network can help me? This is SO often underestimated (by yours truly as well!). Don’t be afraid to ask for help. I’m not suggesting you ask everyone for money all the time but reminding people you’re trying to make a living as a musician and you can help with this and that goes a long way! That’s also how you start getting referrals and more gigs coming in! Is this strategy going to bring enough money in (in the long term, you can’t expect immediate results)? For example, if you’re a beatmaker competing with $1 beats, you’re in trouble. You’ll burn out in no time. Think about how you could sell ONE beat for $20 and you can focus on getting 1 customer instead of 20, 5 customers instead of 100. You need to be as honest as you possibly can when you answer these questions. There’s no point in the exercise if you’re not! Music licensing is a looooooong game and you’ll sometimes be spending months without anything major happening. You still need to keep going when you’re in that hole. That’s why you need to take the time to put together a strategy that makes sense for YOU. Then you can trust the process when you’re going through a period that’s not bringing you a lot of obvious results. If you choose a path that’s not well aligned with your personality and strengths, it’s going to be extra tough to make it. You don’t enjoy writing happy quirky corporate tunes? Don’t spend 6 months trying to close deals with Apple and Ikea. You can’t stand classical music? Don’t set out to make orchestral trailer music because you’ve heard it’s lucrative. I know it sounds obvious, but you couldn’t guess how many musicians nail them down to goals they HATE because they haven’t taken the time to really think about what they want and enjoy doing. The only way to persevere is to set goals that you can reach. And here’s the key – set goals around things you actually control. So as an artist trying to get your music licensed, you shouldn’t be aiming to get 4 placements in the next 6 months. It’s not that it’s impossible for you to get 4 placements in that timeframe. It’s that you can’t CONTROL if you do or not. Each year I will to record and release X number of tracks. I want to have X tracks ready for licensing (complete with alternative versions, keywords and attention-grabbing description) by a certain date. I’ll attend X amount of TV / film networking events you attend. From personal experience, and I’m sure it’s the same with you, efforts bring results. Every time I’ve thrown myself wholeheartedly at something, I’ve made progress. By all means, stretch your comfort zone. You’ll grow and make progress. But don’t aim too high too fast! That’s the easiest route to burnout! If you don’t really like networking, don’t spend 1 grand on a large live event. Instead, start online in a small Facebook group. If you’ve never scored music to video before, don’t try to convince a short-film director featured at Sundance to hire you, get in touch with film school students first. By all means, if you have the energy and endurance, sprint out of the starting blocks! Just know that there’s nothing wrong with slow and steady progress to finish the race. Joyce Kettering (creativeandproductive.com) is a songwriter, composer, music licensing expert, and teacher of the Get Your Music Licensed! program. The music licensing methods she teaches has allowed her to quit her day job at a Fortune 500 company and be successful on licensing alone. I ran into Jim Griffin this weekend and as usual, he got me thinking about music and it’s future. We talked a little bit about Chorus, the new controversial Warner Music backed company trying to create a music utility service for colleges. I’ll tell you the guy is like a bolt of lightning and his fever can leave you doubting what you know yet somehow I always come away with something new to think about and ponder. I listened to him speak briefly and then found a transcription of a similar speech he gave at Midem last year which I wanted to share with you. The complete speech is here: Jim Griffin Speech and a brief excerpt is below. Enjoy! “It sort of struck me once, I was reading Marshall McLuhan, and I recommend Marshall McLuhan to everyone here who has not already read some of McLuhan’s work. McLuhan is a terribly influential person in media in the 1960’s, so much so that if you’ve seen the movie Annie Hall you may recall that he appears in that movie with Woody Allen in a line outside of a movie theater, and he’s very well known for having said that the medium is the message. I always wondered what that meant. And now that we live in a time of MP3, I think all of us can acknowledge that McLuhan had it right, that in some ways it’s more about what format something comes in these days than it is even the music itself. But McLuhan said something else that escaped my notice until say five years ago. He indeed said that you will never understand the media of your time. He said that the media of your time is like the air that you breath. You’re unconscious of it. It’s like the water in which a fish swims. He said that you would only understand your media through the rearview mirror of history. And so it is that it led me back to the library to look through microfiches and so forth from the 1920’s and around that time period, because it was around that time period that electricity started to spread around the world. Before electricity spread around the world, for the most part, it could be said that an artist was in complete control of their art. Especially in the sense that, you know, they controlled it with their feet because if they weren’t in the room you couldn’t see them or hear them. Then in rapid succession over several decades we have the spread of electricity around the world, and loudspeaker systems evolve that make the crowd bigger than you can count. And then very very quickly radio broadcast, and now sounds are traveling many thousands of miles beyond their source. Then television is proven out in 1928. And so now your sound and your image can travel thousands of miles. Now, look, I get how we feel special living in this time that we do of the net. We think, wow, we are beset with change unlike we have ever seen. But I would say that that is absolutely untrue. The 1920’s, the spread of electricity, this was a far more savage time to be an artist. This was a far more difficult time. Our changes, that we are seeing, are merely a gradation of change by comparison to what happened when electricity spread around the world. And so we have something to rely upon that they did not. We have something to look to, which is: what was their experience; how did they handle this dramatic change. I think that without question the way we handled this dramatic change was with collective licensing. In other words, loudspeaker systems, hotels, restaurants, wherever there are performances of music that are so powerful, we have a collecting society that would like to monetize this, and can and does, monetize the anarchy of music moving through say loudspeakers. And equally true of radio, and television broadcast, and cable, and satellite, and as recently as this past decade, we now monetize webcasting over the net in America in just this same way. And so I don’t think it is a great stretch, or that you have to think too far into the future to realize that it would truly be an anomaly if collective licensing did not extend itself further. It does not require a crystal ball to figure this out. Under a plan colleague Gerd Leonhard and I propose, consumers would pay a flat music licensing fee of $3 to $5 a month as part of a subscription to an Internet service provider, cellular network, digital cable service wireless carrier or other digital network provider. This fee would let people download and listen to as much music as they care to, from a vast library of files available across the networks. Certainly a music utility would be a radical and complex undertaking, and there are many important details to negotiate, such as the exact nature of the license, how the funds would be administered, the specific tracking method, what collection of technologies would be employed and others. Yet there are inventors and technologists outside the mainstream music business hard at work trying to figure out how to make this happen. It’s time for the main players in the music business today, namely the large record publishers, to cooperate with the inventors and jointly create a future for music where the money really flows and the global market for music can grow from $32 billion to as much as $100 billion. Originally published in Forbes on January 31, 2005. You can now purchase MP3 files for download without DRM from all four major labels on Amazon.com, emusic and a growing list of music destinations. The predictions that an unprotected format would kill sales have simply not been true. These businesses are exploding. Early proponents of the subscription models Napster and Rhapsody have survived and are growing. There is active discussion of a flat-fee structure for music at major labels where once we were laughed out of the offices. Indie Labels now account for upwards of 30% of total music sales, up from the low 20’s just a few years ago. This is a profound shift in the powerbase that favors the independent artist and innovator. Social music sites such as LastFM, Pandora, iLike and many more are making the fans into tastemakers with the ability to promote and share great new music at the touch of a button. This is all very good news for musicians, writers and artists who want control of their destiny and their careers.